The bald eagle has been used as a symbol of power and freedom in the United States for over 200 years, since the Founding Fathers selected it as a national emblem. Today, the eagle is featured on many of the government’s seals and national currency series. 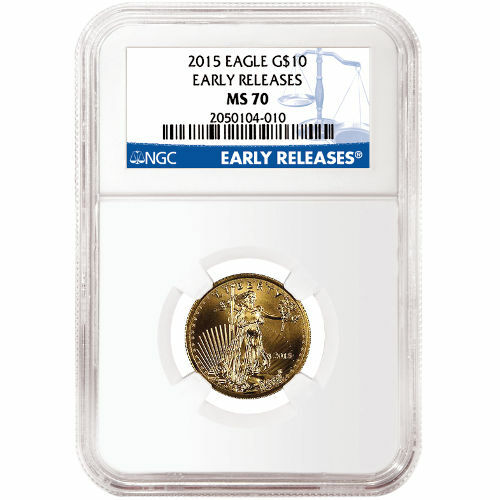 Now, you can own a 2015 1/4 oz Gold American Eagle Coin with an MS70 grade from the Numismatic Guaranty Corporation. These coins come to Silver.com directly from NGC as part of the early release group, meaning they were received by the NGC during the first 30 days of their release. Gold American Eagles are the official gold bullion coin of the United States. The coin program was authorized by Congress in 1985 with the passage of the Gold Bullion Coin Act of 1985. The first coins were minted and sold a year later in 1986. Since then, the Gold American Eagle has earned recognition around the world as a gold bullion coin with the highest quality in design and minting. On the obverse side of the coin is Augustus Saint-Gaudens’ image of Lady Liberty. First seen on the Saint-Gaudens $20 Double Eagle gold coin commissioned by President Theodore Roosevelt, Lady Liberty can be seen walking toward the viewer with a torch in one hand and an olive branch in the other. Engravings include “Liberty,” the year of minting, and stars around the rim representing US states. Founded in 1792, the US Mint is the official production facility of the federal government. All circulation and commemorative coins backed by the US government are produced at one of the mint’s four facilities. The NGC’s MS70 grade means these coins have a perfect mint, with no abrasions on its surface and brilliant strikes. Silver.com wants all of its customers to be happy with their purchase. If you have any questions about our products and services, simply call one of our associates at 888-989-7223. We also offer a live chat feature on our contact page where you can speak with a representative Monday through Friday between 9AM and 6PM EST and Saturday from 10AM to 2PM EST.